Apple’s Preview app, preinstalled on every Mac for years, is one of the most underused programs ever. 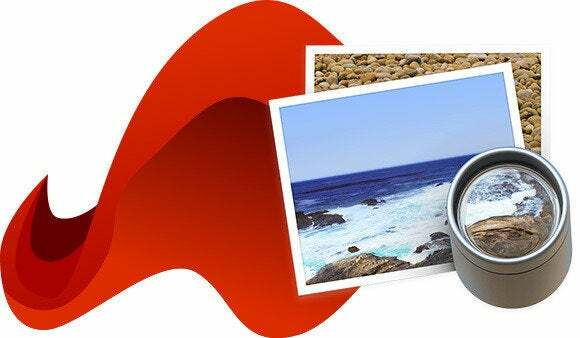 Far from being an image preview app, as its name implies, you can use it to convert file formats, grab a frame from a movie, learn the size of a web-based image, sort a folder of images, remove backgrounds, and more. In this first installment of a two-part series, you’ll begin to discover the many superpowers of Preview. How is this exciting? Let us count the ways. You can convert a PDF file to a pixel-based format for printing (say, if you’ve got a PDF that refuses to print) or for posting on the web (say, a JPEG, GIF or PNG). 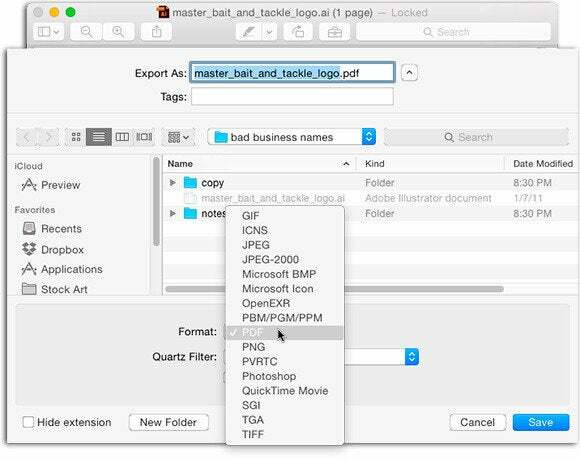 You can convert image files to PDF (say, for emailing a receipt to someone), or perhaps most amazingly, convert Adobe Illustrator or legacy EPS files to PDF format—without the need for Illustrator. To do it, open the file in Preview, choose File > Export and then select a new file format. 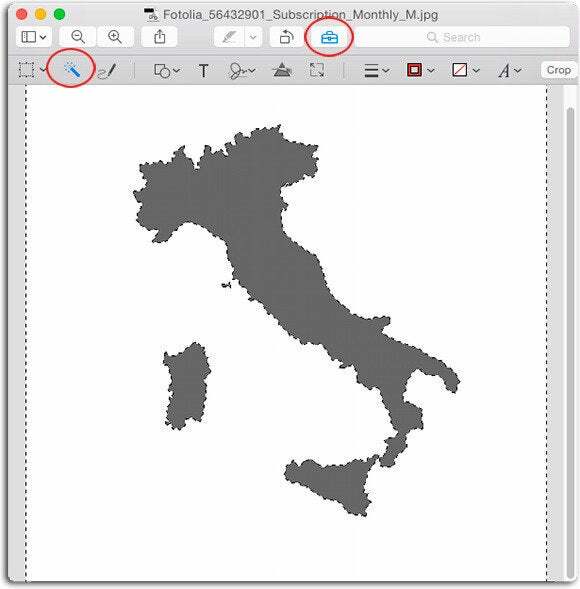 If the original is a vector-based logo or illustration, the resulting PDF will also be vector-based (meaning you can enlarge it without losing quality). Remarkably, Preview’s support of native Photoshop (PSD) and Illustrator (AI) files means that you can send either of these native file formats to anyone using a Mac and they can use Preview to open and print them. If QuickTime Player can play the movie, you can capture a frame from it. Here’s how: just pause the movie at the point you want to capture the frame by pressing the spacebar and then press Command-C to copy it to your clipboard. In Preview, choose File > New from Clipboard, and it creates a new file containing the frame from your movie. You can then save the file in whatever format you need. To quickly remove the background behind an object or logo (say, to place the object over a new background), activate Preview’s Instant Alpha tool by clicking its icon in the toolbar (it looks like a magic wand). Next, click and drag atop the background; if you don’t see the Instant Alpha tool, click the Markup Toolbar icon to display all the markup tools (it looks like a toolbox). As you click and drag atop the background, your selection appears as a pink overlay that indicates the areas that will be removed. When you’re finished, export as a PNG file to maintain transparency. To copy a portion of an image, open it in Preview and simply click and drag to draw a selection rectangle atop the image. Next, press Command+C to copy it to your clipboard, then press Command+N to create a new document containing the contents of the clipboard. To make a selection from its center outward (instead of corner to corner), hold down the Option key before or during the drag. Add the Shift key to constrain the selection to a square. Here’s a quick way to save an image from a website, and determine its exact dimensions: just drag it directly from the webpage onto the Preview icon in your Mac’s Dock. 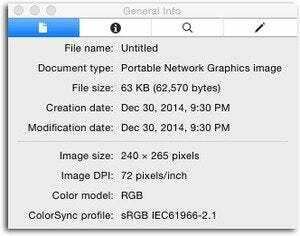 Next, choose Tools > Show Inspector (or press Command-I) to summon a panel that shows its size, file format, etc. Using Preview’s Inspector is a super fast way to learn the dimensions of images on the web. Preview’s sidebar is a great tool for sorting images before you commit to importing them into your image editing app (say, iPhoto). For example, if your friend hands you a memory stick of 100 images, make three folders on your desktop named “originals,” “keep,” and “toss." Drag the files from the memory stick into the originals folder and open them in Preview. Next, drag thumbnails from Preview’s sidebar into the appropriate folder (“keep” or “toss”). The original files will be left intact, but copies will appear in your sorting folders. When you’re done, delete the originals folder. If your images don’t appear in the sidebar in the order you prefer, you can either drag them up and down to reorder them, or Control-click the white space in the drawer and use the resulting menu to sort by name, path, date, size or kind. You can also drag a thumbnail to the Trash icon to delete the original file, or drag it onto the Photoshop icon in your Dock to open it in that program. 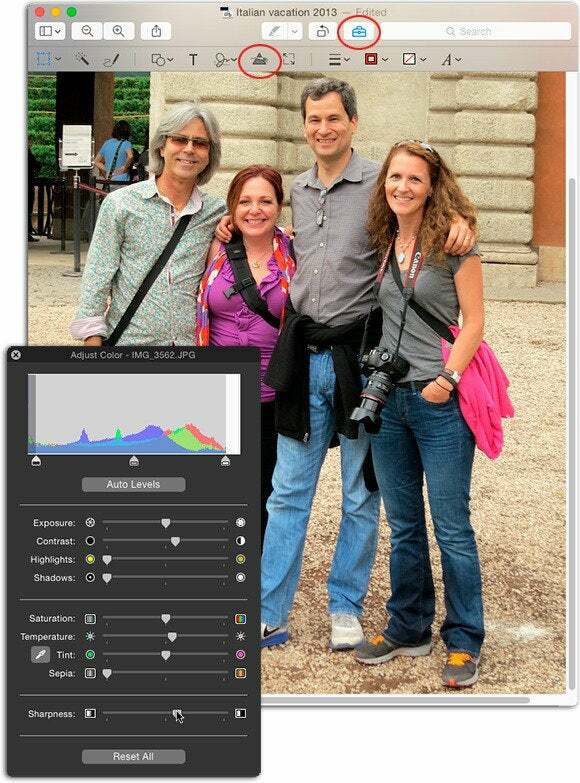 In Yosemite, Preview sports an Adjust Color panel, which is similar to the controls in iPhoto’s Adjustments panel in Edit mode. To use it, open a photo and then click the Markup Toolbar icon to display all the markup tools (it looks like a toolbox). In the toolbar that appears, click the Adjust Color icon (it looks like a pyramid or prism). The Auto Levels button improves most images by adjusting brightness levels; however, there are also individual sliders to adjust Exposure, Contrast, Highlights, Shadows, Saturation, Temperature, Tint, Sharpness, or add a Sepia color. To quickly adjust an image, try using Preview’s new Adjust Color panel. Next week, tune in to learn even more Preview super powers, especially for PDF files! Until then, may the creative force be with you all. PhotoLesa.com founder Lesa Snider is the author of the best-selling Photoshop: The Missing Manual books, coauthor of iPhoto: The Missing Manual, author of The Skinny Book ebook series, a founding creativeLIVE instructor, and regular columnist for Photoshop User and Photo Elements Techniques magazines.